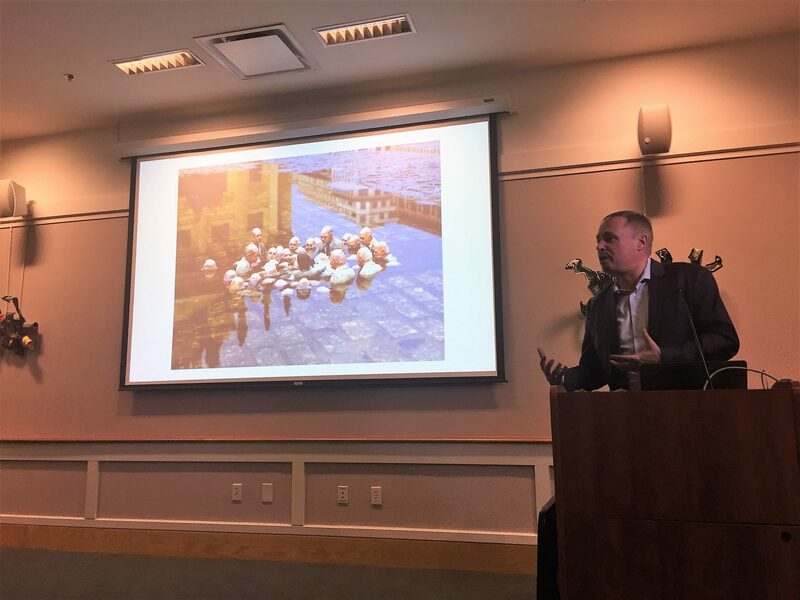 On December 6th, 2017, PS 21 — a local non-profit that encourages discussion and policy development around planning issues in Portsmouth — convened an event called “Shall We Go Dutch? What Portsmouth can learn from The Netherlands & NYC’s response to Hurricane Sandy”. 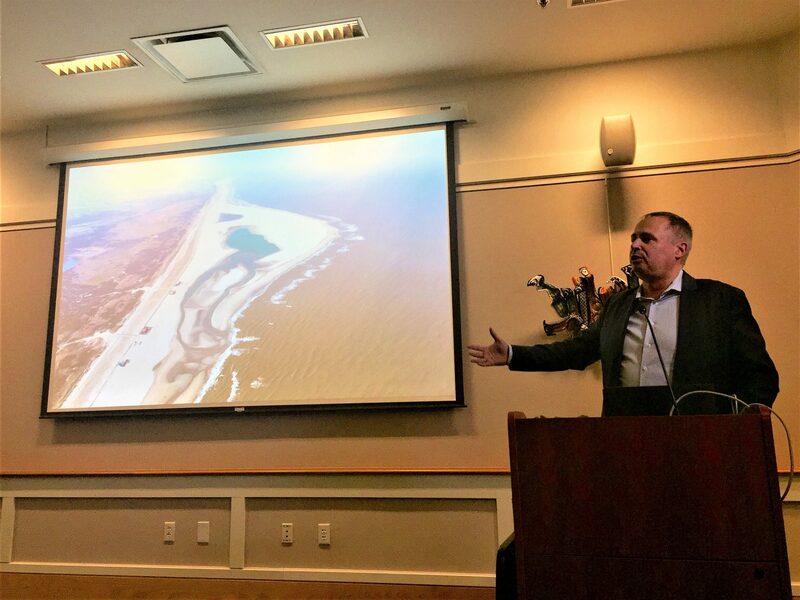 The Netherlands has been embracing innovative flood protection strategies for many years now, while New York City is taking the lessons that it learned from Hurricane Sandy very seriously. 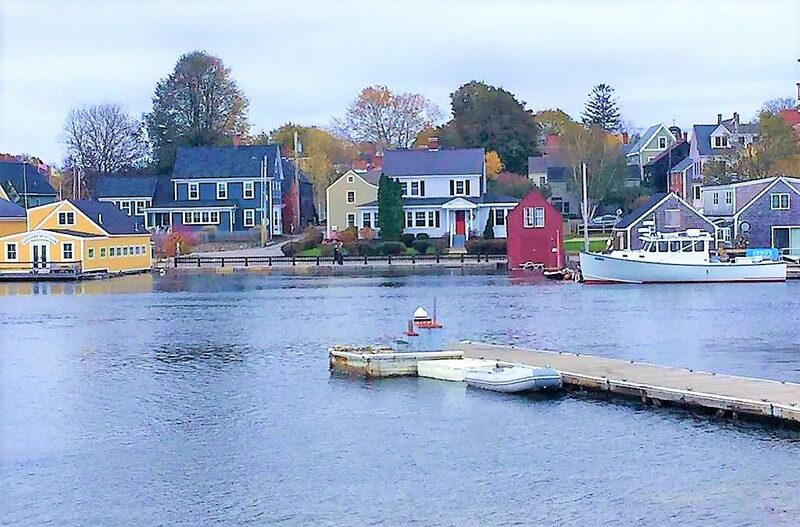 How can we steal adapt their best practices for Portsmouth and seacoast New Hampshire, while simultaneously using it as an opportunity to improve the places we live, work, and play? This event gave us some stellar insights. The speaker was Matthijs Bouw, a Dutch architect and urbanist. He is the founder of One Architecture, an award-winning Amsterdam and New York-based design and planning firm. In reality, his firm is part of the team that won the Rebuild By Design competition, an initiative launched by the US Department of Housing and Urban Development (HUD) that brings together multiple stakeholders to find innovative solutions to complex environmental challenges. 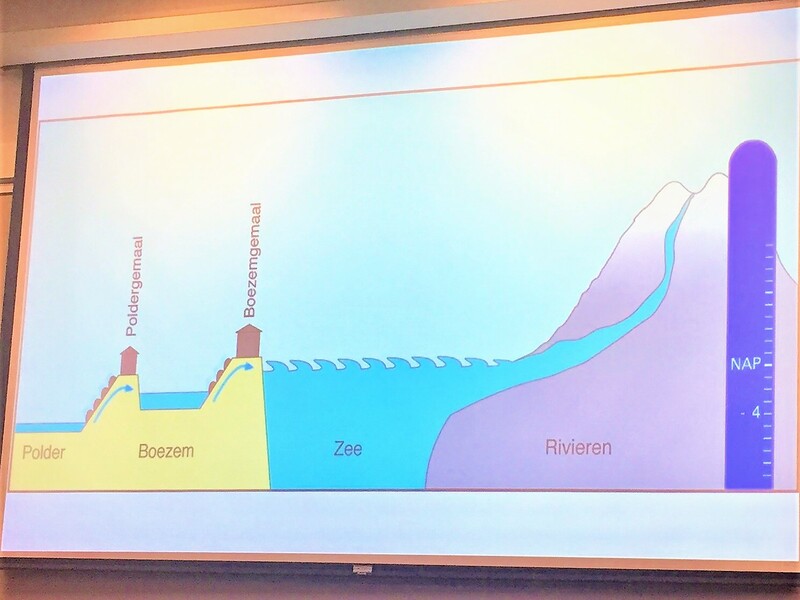 Bouw described how water protection is embedded in the culture of the Dutch. A large part of their landscape is located below sea level, very flat, and prone to flooding. The Netherlands has seen bottom up approaches in water management where local communities invest in dykes to reclaim land from swamps. They have an extra layer of local governments based on watershed delineations. During elections, contesting parties debate on their values surrounding water issues. As a community, they choose to be ruled by water rather than being ruled by royalty. About half a century ago, the notion was that water should be kept out at all costs. National projects were undertaken to seal off the arms of estuaries to “keep out the water”. However, they realized that this has negative effects on the ecology of estuaries, and slowly changed their approach to think more holistically about shoreline protection. Designers in the Netherlands started planning infrastructure in such a way that end-users would have a reminder of the impacts of living with (rising) waters. Matthijs Bouw showed us a compelling example of a bridge which had multiple elevations. Some parts of the bridge are partially flooded during high tides. The bridge is a living marker of sea level rise and the reality of climate change in the Netherlands. Bouw reflected on how conversations around resilience differ between the Netherlands and the United States. In the Netherlands, resilience meant protecting water and managing it at the grassroots level to benefit people and preserve culture. In America, he found that resilience was more about preparing for shocks and stresses. While working in New York, he realized how personal the idea of resilience was. He saw it reflected in the eyes of individuals who lost power during Sandy, and in the eyes of neighborhoods and communities who bounced back because of their social connectedness. Resilience is not just about preparing for shocks and stresses. We should also look at it as an opportunity to improve cities and places where we live. Bouw showed us a video describing the impacts of Hurricane Sandy, an event that yielded 14 foot high tides, catching people off guard. There were stories of infrastructural damage, but also personal stories about loss of livelihoods and the disproportionate impact on vulnerable communities. Together, these narratives fueled the city of New York into action. The Rebuild by Design competition put out a call for collaborative, innovative solutions for managing sea level rise and storm surge. That’s where Matthijs Bouw and his team came in. Their idea was the “Big U’. Studying the literature, they found that a resilience report for New York City recommended 8 continuous miles of coastal protection in Manhattan. But how can this be done? What about waterfront access? And how would a large seawall like that be maintained? Proposed waterfront enhancement project as part of the Big U. Instead of coming up with a design up front, they first came up with a process to create a program and organize stakeholders. Taking a cue from the High Line, an abandoned railroad that is now repurposed into a 1.45 mile long elevated linear city park, the Big U team proposed that the 8 mile long “seawall” be broken down into infrastructural fragments whose designs that would be driven by their respective communities. The Big U made it to the second round of the competition, and is now in the construction phase along with a number of collaborators. Deployable public art: Large sheets along the shoreline which can be “flipped down” in the event of the storm. These sheets would have lively waterproof artwork and lighting in order to give life to the public space. “Reverse Aquarium”, a public contemplative space where you can view seas rising over time. 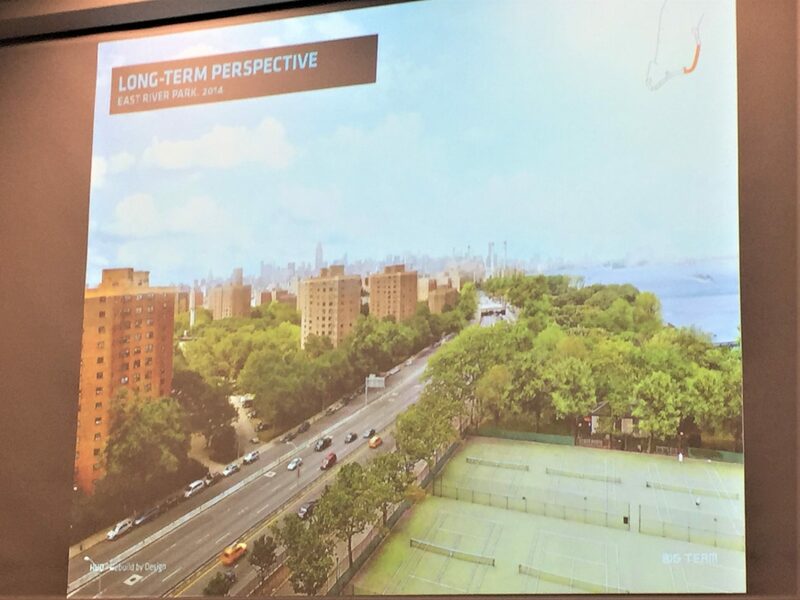 Undoing Robert Moses by removing the FDR drive, a freeway that keeps public housing communities disconnected from parks and the waterfront. Pavilions with farmers markets, benches, and community spaces embedded in green infrastructure projects to revitalize neighborhoods. Click here to learn more about the Big U and check out what it looks like. 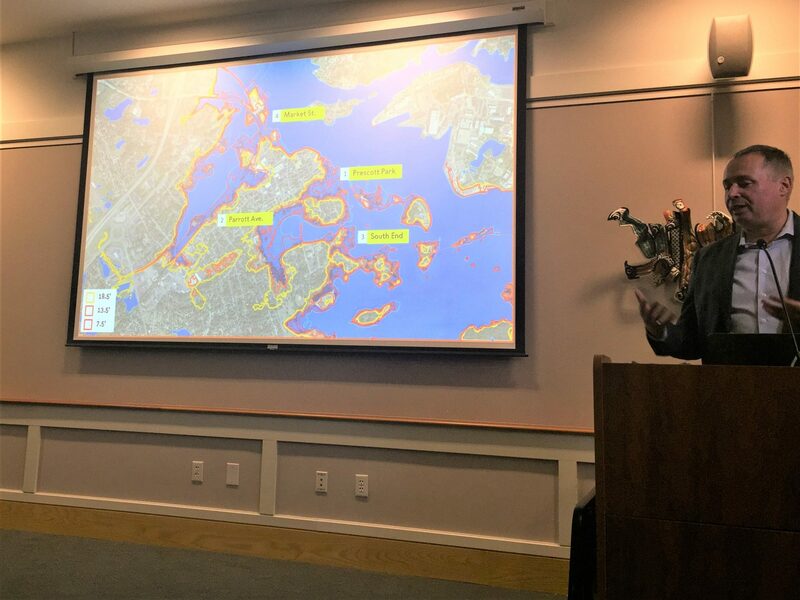 While Bouw refrained from giving site-specific suggestions on resilience options for Portsmouth, he shared some larger lessons learned from his experiences that could benefit communities here in the seacoast. 1) It is important to rethink land use decisions, build less on the floodplain, & build more upland to create urban density. 2) Involving local people is a great way to yield constructive information that can improve projects. Bouw suggested clearly thinking through the public input process, making it easy for the public to understand what goes on at each design phase. He suggested streamlining information to present key points rather than a lot of technical information. It is the designers’ responsibility to create inclusive processes; and it is the communities’ responsibility to participate. 3) A layered approach that builds redundancy into the system is the way to go for long-term planning. The first step should be “what can we do now so that we can buy time for other stuff that needs to happen to effectively prepare for climate change?” The consequent future steps will fall in line if the communities are involved from the beginning because they are the best source of context-specific information on why a certain decision was made. 4) There is no “catch all” solution. But if we get an early start to preparing for the inevitable future of flooding, we’ll even have enough time to make our projects look “pretty” and aesthetically enhance the areas we live in. 5) Nature is strong. Don’t fight with it, work with it. 6) Sometimes, having conversations about climate change can be hard. However, everyone understands risk. To make these projects succeed in areas where climate change is a controversial topic, having conversations centered around risk can provide the impetus needed to move these projects forward. You can find a video of the event here, and also a lively 4-minute video on proposed flood protection measures for lower Manhattan.